The corporation was a creation of government to provide a vehicle for economic growth. It was intended to provide a means of pooling capital from investors to develop businesses that would benefit the state by providing jobs and economic benefits.Corporations were more attractive to investors than partnerships because, in a corporation, the shareholders have no responsibility for the business’s debts or other liabilities. Their potential losses are limited to their investment. Almost from the beginning of the nation, it was considered a social good to have successful businesses providing employment, andtax revenues. Through a series of early Supreme Court decisions, corporations received many of the same Constitutional protections as individuals, including property and contract rights. As a creation of the state, corporations have duties to the state. They are subject to its laws, regulations and taxes. However, contrary to some beliefs, the Supreme Court never has ruled that a corporation is a person. A chief justice in the 1880s said in dicta in a decision that they were, under the 14th Amendment,but that simply was his opinion, and it never has been validated by a full court decision. In recent years, however, the Court has expanded the rights of corporations to include some previously held by individuals only, including the right to free speech.The Supreme Court’s recent decision in Citizens United that permits corporations to makeunlimited contributions in political campaigns expanded earlier decisions of the Court by ruling that there can be no limits on the amounts of money corporations contribute to political action groups because money is equivalent to speech, and speech cannot be limited. While rights of corporations have been expanded, their duties and responsibilities have not been. They are not subject to the restrictions imposed on governments in the Bill of Rights of the Constitution. They do not face the same kinds of penalties for violations of laws that people do. If individuals committed the kinds of frauds that corporations practiced as part of the subprime mortgage scandal, they would go to prison, but the corporations involved just had to pay fines, fines they could easily afford. None of their officers, or directors, faced criminal charges. The Citizens United decision has been quite controversial, and has been subject to considerable criticism. A movement is underway to amend the Constitution to limit the definition of corporations so that they do not have all the rights of individuals. Until that, or some other change occurs, the decision has given corporations more potential legal influence on politics and government than ever before. With the ability to spend enormous amounts of money on behalf of political candidates, the huge multinational corporations that have little loyalty to the US, as well as extremely wealthy individuals, are positioned to exercise much greater influence on American governmental decisions at both the federal and state levels. Those decisions range from lowering taxes and regulation to giving private enterprises greater control over government functions through privatization. There is an enormous risk that far more activities of government will wind up being performed by profit-seeking businesses that do not face the same kind of public scrutiny and political control that government agencies do. Major industries also may obtain far greater control over natural resources and be able to exploit them with less regulation, particularly environmental regulation. The implications of the growing power of multinational corporations, and the continuing failure of governments to control them, are still not fully appreciated. This concentration of power is one of the worst legacies of the Reagan era, but one now shared with his successors. It is time to do something to control their behavior. Just as the United States today is different from the country of our parents and grandparents, today’s corporations are radically different from those of the “Gray Flannel Suit” of the 1950s. Management structures are different. Incentives are different. Career paths are different, if there are any. It is quite uncommon today for people to spend their careers with one company. Major areas of business generally are dominated by a small number of companies, oligopolies – and in the major industries those companies aremultinationals. The Alfred P. Sloan, traditional vertical, or military-style, organization, with many layers of middle management, in use in most major corporations for much of the 20th Century, was abandoned late in the century. It was replaced by horizontal functional organizations requiring fewer layers of management, ultimately eliminating the jobs of many middle managers. The result was significant improvement in productivity, which began to show in the 1990s, but also the elimination of millions of middle-class jobs. The expansions of the computer and telecommunications industries not only made it more feasible for corporations to move operations overseas, but for a period of time, the jobs created in the US in these new fields masked the impact of the loss of more traditional jobs. But millions of manufacturing and customer services jobs disappeared, either from relocation to foreign countries, or as the result of automation. During the Reagan, George H.W. Bush and Clinton Administrations, there were a number of developments that had an enormous impact of any on the way corporations were managed. In 1977, Alfred D. Chandler, Jr., a Professor at the Harvard Business School, was awarded the Pulitzer and Bancroft Prizes the The Visible Hand; The Managerial Revolution in American Business. The title comes from Adam Smith’s use of the term “the invisible hand” which he said was the “market” guiding business decisions. Chandler’s thesis, backed by a comprehensive study of the growth of American business from the start of the Republic to the second half of the 20th Century, was that once moderncorporations appeared in the 1850s – the railroads and the telegraph companies – the “invisible hand” was replaced byprofessional managers. Over time, those professional managers became such a force in the governance and direction of American corporations that their interests, including those of other employees, were served even more than those of the shareholders, despite the fact that the legal responsibility of corporations was to shareholders. No state law imposed a fiduciary responsibility on a corporation to itsemployees, or to the communities where it operated. The presence and power of this class of professional manager was a major factor in long life spans for successful companies,lifetime employment for many employees, and generous, but not outrageous, compensation and benefits. Steady stock growth was important, but quarter-to quarter performance was not the prime focus of management. Stock options and other performance-based forms of compensation were not as significant as they are today. Most large companies had their own pension programs, which further encouraged lifetime employment. Several other developments influenced investors in the 1980s to become more demanding. Corporations came under greater pressure to maximize shareholder returns by improving stock performance, especially quarter-to-quarter performance. The growth of 401-K plans may also have had an unintended consequence. The 401-K plans had enormous appeal to employers as replacements for the pension plans they had to fund. With 401-K plans, they contributed a certain percentage of their salary or stock to the employee’s account, and then had no further obligation. Unions also liked them because they gave employees a greater share of company ownership. Unlike pensions, the 401-K plans were portable. Employees who left a company could “roll-over” their old 401K into the new employer’s plan. The great percentage of a 401-K plan usually is invested in mutual funds. The company’s stock contributed to the plan could be exchanged for mutual funds as well. The 401-K plans as replacements forpension funds not only lessened the ties between employees and their employers; they also created a huge pool of mutual fundinvestment that forced changes in corporate management. The ending of pensions in many companies meant that one of the legs if the “three-legged stool” of retirement, as contemplated in the 1930s when Social Security was enacted, was effectively eliminated. The original concept of Social Security was that it would represent one of the legs of a “three-legged stool” of retirement, the other two being savings and pensions. The 401K is a savings plan, but it has been used to replace pensions, thus reducing the stool to two legs. And many 401K plans have not been successful, thus reducing the stools of retirement for many of their participants to just one: Social Security. And for this reason, there will be growing pressure to increase Social Security benefits. Within a few years of the advent of 401Ks, more than 50% of the stock of public companies was held by mutual and pension funds, rather than by individuals. Unlike many traditional individual investors, institutional investors have little emotional attachment to the companies in which they invest. Their only interest is in buying stocks that will increase in value, and, in many cases, the increases are expected in the near term. If companies do not perform as expected, or better, their stocks are dumped, and their stock prices decline, sometimes substantially. This increased emphasis on short-term stock performance put enormous pressure on CEOs to improve their bottom lines and keep their stock prices rising, on a quarter-to-quarter basis. Corporations thinned out their management ranks, and looked for other ways to improve profits, such as shifting operations to less expensive foreign countries. In 1992, the Securities and Exchange Commission promulgated new regulations of executive compensation of public companies, requiring greater disclosure and justification based on company performance. In 1993, the corporate tax code was modified regarding executive compensation. Under Section 162(m) the amount of a corporate executive’s salary in excess of $1 million could not be tax-deductible unless it was based on performance, and was disclosed to shareholders and approved by majority vote. Neither regulation worked. Executive salaries continued to escalate. Companies either figured ways to comply with the regulations, frequently tying compensation to stock performance, or they ignored them. The regulations did provide greater motivation for corporate executives to focus on short-term performance and the stock price. These different, and varied, pressures on executives to maximize short-term results had that effect. Increasing shareholder value – mostly through increasing the stock price, but sometimes meaning selling the company – became the primary duty of corporate senior managements, at the expense of all other stakeholders, and sometimes the longer-term interests of the company. Quarter-to-quarter stock performance became the most important measure of success. It provided a justification for massive increases in CEO, and senior executive, compensation keyed to stock performance. With such a short-term focus, there is little incentive for companies to take chances on higher risk ventures, technologies, or innovations that require years to produce results. More patient foreign companies, with longer horizons, have gained great advantage. For example, many Japanese companies typically operate on a 20-year business plan. American companies operate on much shorter plans, usually not longer than five years, and almost never longer than ten. The investment community, which provides the capital for start-ups and expansion, usually has even shorter horizons for obtaining returns on its investments. This made it very difficult for an American company to raise capital to develop advanced technologies that might take five to ten years, or longer, to produce profits. A good example is what happened to Zenith, once upon a time one of America’s most famous electronics companies. Zenith invented the flat-screen for television, and received an Emmy Award in 1981 for it. But Wall Street would not provide Zenith with the capital it needed to take the product to market, and Zenith sold its interests. Zenith was also a pioneer in the development of high-definition television, but it never took a product to market. Eventually, LG, the South Korean giant, purchased Zenith, which now operates as a subsidiary. But along with Zenith, and others, the United States lost the entire electronics industry. The people with the money did not see a quick enough return for them in the American companies. Following that pattern of consumer electronics, many fast growing areas of high tech and precision technology became the specialties of countries more willing to wait for longer term payoffs, including Japan, South Korea, Germany, Canada, Finland,Sweden, and, more recently, China. Most personal computers, cell phones, and wireless transmission equipment, are manufactured outside the US, including the sensationally successful Apple I-Phone and I-Pad. The demand for quarterly performance also meant that if the stock price of a company with solid assets and good cash flow stopped increasing at the pace expected by Wall Street, the company could become a target for a takeover. Such takeovers often resulted in a break-up of a company’s assets, and the laying off of most, if not all, of its employees. Such takeovers usually bring a premium on the current stock price and are justified by company management as the only way to maximize shareholder value. With corporate management’s fiduciary duties entirely to shareholders, no consideration is required to the communities where companies operate, for the benefits the communities may have provided to the corporations nor to the dependencies and loyalties of employees. In recent years, there has been a movement to change this state of affairs. Approximately thirty states have adopted “Constituent statutes” that permit corporate managements to consider factors other than shareholder returns when making major decisions. In 2010, Maryland adopted a new form of corporation, the “Benefit” corporation, also known, slightly incorrectly, as the “B Corporation.” Many other states and the District of Columbia have since adopted similar legislation. This form of corporation is a hybrid between a for-profit and a non-profit corporation. The corporation commits to providing a “public service” and the fiduciary responsibility of the management is extended beyond shareholders to other stakeholders, including employees, communities, and the public in general. Actions can be brought against the management of these companies to enforce this broader range of responsibility. These changes have been heralded as injecting a new sense, and a new opportunity, in business for social responsibility. If universally adopted, these changes hold the promise of ending the period of almost mindless commitments of companies to short term profits, and may slow down corporate mergers and acquisitions. However, it remains to be seen if these changes in fiduciary responsibilities have a chilling effect on capital sources. All companies need capital, and some need a great deal. Some types of investors, particularly mutual funds, may not find this type of corporation particularly attractive. As a result of the laissez-faire and deregulation practices of Reagan and his successors, consolidation within industries accelerated. The Federal Communications Commission eliminated many of the regulations of broadcasting, including equal time and fairness doctrine rules that required broadcasters to make time available for different points of view. The FCC also eliminated most restrictions on ownership, which permitted massive consolidation of ownership of broadcast stations and networks, greatly reducing competition and access to the media by all points of view. The lack of enforcement of antitrust laws accelerated the formation of giant multinational corporations that now own most of the major brand names. And because of the rapid expansion of economies around the world since the end of the Cold War, manymultinational corporations no longer rely on the American market for the majority of their revenues, or profits, and, as a result, have less loyalty to the US, if they have any. Resources are focused where they are likely to produce the greatest profits, and recently, that has not been in the United States. The existence today of multinational corporations so huge that their incomes are larger than most countries’ GDP is one of the most significant business developments in modern history that has yet to be fully understood and evaluated. Many of thesecorporations operate almost entirely independently of any nation’s laws, and essentially are virtual countries, without the restrictions and limitations that real ones have. Some, like Exxon-Mobil, have their own armed forces. Collectively, multinationals control trillions of dollars and much of international trade, banking and commerce. They have the powertoday to destroy the economies of countries, if they choose to do so, or to exercise such influence that they virtually own countries. Corporations already play large roles in domestic US politics. Given the Supreme Court’s Citizens United ruling, if they chose to, they could play even bigger roles. While the oil companies contribute large amounts of money to Congressional political campaigns, most have not played major roles in Presidential elections. But, it isn’t accidental that Republicans chant “drill, baby, drill.” They have been paid to do so by the oil industry. The oil industry tries to shape American opinion about it and its primary products through advertising and opinion making. The oilindustry has spent millions of dollars ontelevision ads to persuade Americans that fracking is a safe means of recovering natural gas, and that offshore drilling, sand and shale oil will be economical replacements for foreign oil. One of their slick advertisements has a smooth-talking, attractive woman assuring Americans that all this oil means “a bright future” for American energy. Corporations like Exxon-Mobil also provide funding to think tanks, and to research projects, to try to develop support for their positions through scholarly research and publications. Some of this work is used behind the scenes in the oil industry’s lobbying against environmental regulation and restrictions that might help to prevent, or at least, mitigate the numerous hazards oil and gas development entail, including massive oil spills, pollution of fresh water aquifers, and now, because of fracking, earthquakes. Some of the scholarly opinion that questioned the validity of climate change theories also was financed by energy company funds. The Koch brothers, whose father was one of the founders of the ultra-right wing John Birch Society, and who now control Koch Industries, the second-largest privately held corporation in the United States, have gained great influence over prominent think tanks such as the Heritage Foundation, and Cato Institute and they have provided funds directly, and indirectly, to a network of regional think tanks, as well as to a number of universities. They also have spent hundreds of millions of dollars on behalf of Republican candidates, and financed dishonest television ads against the Affordable Care Act. As long as oil is the primary fuel of the United States, it will be important to have successful oil companies. However, much tougherregulation is necessary, particularly in areas such as offshore drilling, where the oil companies have proven they do not have the technology to deal with massive oil spills. As we have seen in the Gulf of Mexico and with the Exxon Valdez, oil spills are with us forever, continuing to do damage to the environment and to us. The risks of major oil spills in pristine areas such as Alaska, or the Atlantic Coast are too great to justify any oil drilling. No additional offshore oil drilling anywhere should be permitted. A great example of how government laws and regulations can be manipulated to favor private interests is evident with what happened with fracking regulation. This lack of regulatory oversight can be traced to many illnesses and even deaths for people and wildlife across the country. There are a variety of chemicals used during the many phases of oil and gas development. These chemicals also produce varying types of waste throughout these processes. This is a perfect example of where substantially increased government regulation of corporate behavior is critically needed. The restrictions on the EPA in this area must be lifted. Fracking must be brought under much greater scrutiny. It is time for the United States federal government to become far more aggressive in controlling and regulating multinationalcorporations and international business activity before it becomes so large and so independent that it is beyond control. These giant multinationals are a threat to free enterprise and to democracy. They are enemies of both, and, increasingly, they are using their economic and political power to stifle competition, and to make themselves more dominant. There has been massive consolidation within nearly every industry during the past 30 years. Even though the GDP has tripled since 1975, there are 18 percent fewer stocks traded today than there were 40 years ago. 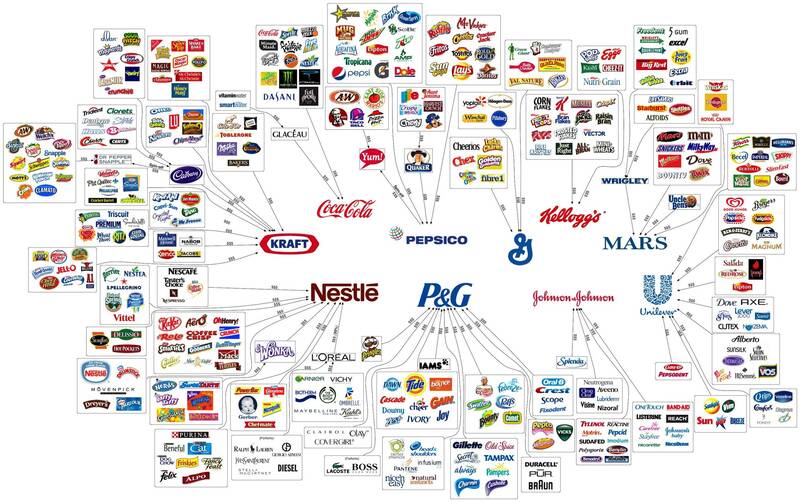 In consumer products and food, one chart shows how ten companies now control virtually everything we buy. True competition is vanishing from the consumer marketplace. There is no one agency in the federal government responsible for the regulation of corporations. That responsibility is divided among various cabinet departments and independent agencies, each regulating different aspects of businesses. When created in 1913 to replace Theodore Roosevelt’s Bureau of Corporations, part of Commerce Department, the Federal Trade Commission was supposed to enforce the Antitrust Laws. In fact, it was created to enforce the Clayton Anti-Trust Act, which was adopted with it. For the most part, the FTC has not played that role. Its primary focus in recent years has been on consumer protection. Various studies of the FTC’s history have been highly critical. The Justice Department today is the lead organization for enforcement of the antitrust laws, but antitrust actions are seldom taken. As a result, during the last 30 years, there has been consolidation of industries on a scale not seen since the trust days of the late 19th and early 20th Centuries. Now, those consolidations occur on an international level – creating business entities of such enormous scale that they are almost beyond regulation. It is time to change the regulation of corporations by consolidating most regulation in one department, as Theodore Roosevelt did. Regulation of corporations by the federal government is tricky because corporations do not get their authority to go into business from the federal government. They get their authority from the state where they file their charter. The federal government’s authority over corporations comes primarily from the Commerce Clause, which gives the power to regulate commerce “among the states” to the federal government. For a long time, due to various Supreme Court decisions, it was difficult for the federal government to regulate businesses that were not engaged in interstate commerce. Later decisions of the Court opened up federal regulation of many areas, but with the current Court’s conservative majority’s recent attempts to limit the scope of the Commerce Clause, changes in federal regulation of business must be carefully constructed. The federal government clearly has Constitutional power to regulate the actions of corporations and individuals when it comes to public health and safety, including the environment, and the effects of their actions on natural resources on public lands, including water supplies. The federal government has clear authority to prevent monopolies and constraints on free enterprise. There is plenty of Constitutional room to do what needs to be done. Substantially increased federal regulation of corporations is critically necessary to the survival of the American democratic republic. That includes restrictions on the roles corporations can play in government. Conflict-of-interest and full disclosure requirements must be imposed on both corporations doing business with the government and with all government officials, including members of Congress. We are very close now to almost complete corporate control of America. All it might take to eliminate the word “almost” is the election of a conservative Republican President. American corporations must be discouraged from moving operations out of the country, rather than encouraged, as they have been by trade deals and government policies. No more trade deals should be approved without much greater protections for American workers. For companies that are not in financial distress, but simply are seeking ways to increase profits, the cost of closing plants to relocate functions outside the country should be increased substantially, so that it isn’t profitable to do so. Relocating plants of successful companies from the United States to countries with lower-wage workers should be subject to various penalties, including excess profits taxes and long-term financial compensation to laid- off workers and to the communities where the companies were located. To reduce the attraction of moving jobs offshore, very high tariffs should be applied to any products made by those new foreign facilities that the company wants to import into the US, so that there is no financial benefit of employing slave labor, or workers at extremely low wages, in other countries in place of American workers. It should become national economic and foreign policy that the United States will not permit any company operating in the US to benefit from the employment of slave labor, or from severe exploitation of impoverished workers in other countries. This should apply to retailers such as Walmart and K-Mart/Sears that purchase a huge amount of products from China, some of which may have been manufactured in “labor” camps, prisons for political prisoners, or others the Chinese government wants restrained. China recently announced it planned to close the labor camps, but there still are huge manufacturing facilities in China that operate in almost the same manner, with workers forced to work extraordinarily long hours at very low ages. No retailer should be allowed to import products from other countries when the only distinction the product has versus American competitors is that it costs less because of significantly lower wages. Not only would such a policy benefit American industry, and improve the American economy, it would equally benefit the economies, and peoples, of many other countries. Finally, there should be severe economic consequences to any American company that moves its headquarters offshore to avoidtaxes, including restrictions on their ability to do business in the US. Equally, there should be rewards for companies to locate their headquarters in the US and make their revenues subject to US taxes. In his 2015 budget, President Obama proposed a new system of taxing the offshore profits of American corporations at lower rates that, if enacted, could generate hundreds of billions of dollars in new revenue over a period of time, and enable corporations to repatriate profits at lower cost. The odds that the Republican Congress will enact his proposal probably are not very good. The history of capitalism shows that great abuses always have resulted from great concentrations of economic power, and there is no reason to believe they will not occur again, but now it could occur on a scale never before imagined. It is time for Congress to review government regulation of corporations with a goal of learning from them by consolidating regulation in one agency charged with increasing the scrutiny of antitrust behavior, and behavior that endangers the financial and political stability of the United States. Congress also should eliminate exemptions from regulations that the oil and gas industry have received, and should adopt the other regulations discussed above. These changes are unlikely to happen so long as Republicans control Congress. The issue of the threat – and the effects – the real effects on us – of corporate dominance of government must become a political issue. The conflicts-of-interest of Republican members of Congress who gain financially from actions they take on behalf of wealthy corporations must be exposed. The exemptions from regulation are a scandal that never has gotten the attention and focus it should have. Fracking is a national danger and it must become a political issue. We need oil, but at what cost? Democrats must step up. They must cut their ties to the multinationals and the big banks. They must stand up for the people. They must organize to defeat the Republicans, regain control of Congress and stop the corporate takeover of America. 1. See Gelter, Martn. “The Pension System and the Rise of Shareholder Primacy” June 7, 2012. In which the author argues that the development of the 401-K is a prime cause of the conversion of “managerial capitalism” to “shareholder capitalism,” the changes of the focus of corporate management from its own interests to an almost exclusive focus on the interests of shareholders. 2. For a comprehensive review of the failure of the IRS regulation to control executive compensation see, Steven Balsam. Taxes and Executive Compensation. Economic Policy Institute, Aug. 14, 2012. Briefing Paper #344. Dan Riker is a progressive writer and novelist who now lives in Portland, Oregon. In addition to A Light Not of This World, he is the author of Seneca Point, a detective mystery, and two other books, yet unpublished, The Blue Girl Murders, a historical mystery set in Baltimore in 1966 and Let’s Do What Works and Call it Capitalism, a work of historical, political and economical analysis that advocates a return to progressive government, government that serves all the people, not the special interests. He is a graduate of The Johns Hopkins University and the University of Baltimore School of Law. He was a journalist with United Press International, a telecommunications executive with MCI Communications and Pocket Communications and co-owner with his late wife, Janis, of Basset Books LLC, a dealer in collectible, out of print and used books.